The Girard School District Foundation awarded five innovative grants Spring 2013. The grants are designed to encourage faculty to develop and implement projects which will enhance and enrich educational programs and be a direct benefit to our students. Tricia McKenzie was awarded a grant in the spring of 2013 to enhance the newly-constructed primary playground at Elk Valley Elementary benefiting students in pre-kindergarten through first grade. Some items purchased with this grant included a three-wheeled scooter and traffic signs to familiarize the children with street signs and the safety actions related to them while walking or riding their tricycles or bikes. This will help in preparing students as they start walking or traveling down streets independently. Amy Nuzback was awarded a grant to purchase “wiggle seats” for use in her classroom at Elk Valley Elementary. These cushions have been effective in assisting students who may have difficulty staying in their seats during large-group instruction or seat-work by allowing students to engage their core muscles and increase attention to the task at hand. Students can silently bounce and swivel while remaining in their chairs. Mrs. Nuzback has found this to be extremely helpful with her kindergarten students as they adapt to the increased amount of seatwork throughout their school day. Ashley Church was awarded money to purchase an iPad for use within the gifted program at Girard School District. The iPad has proven to be a versatile teaching tool benefiting elementary through high school students. Thus far students have used it as they learn fractions, foreign languages, and research various projects including a documentary of Presque Isle in conjunction with the Tom Ridge Environmental Center. Ashley has found an additional use with ESL students as they learn vocabulary and concepts associated with the English language. Amy Mason used grant money to purchase a text book, International Cuisine, to be used in the Family and Consumer Science classes at the Girard High School. This text has enhanced students learning about food safety, team work, career exploration, along with applied math and literary skills in following and converting recipes to necessary size. Future use may include the use of this text in a co-teaching opportunity with the GHS French teacher in exploring the culture and food in the various regions of France. 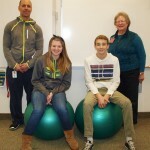 Scott Russell received a grant to partially fund an interesting project involving the use of exercise balls as classroom seats in health and driver education classes. Research has shown the use of exercise balls as chairs increases students’ ability to focus, concentrate and improve their overall attention span. In addition to engaging their brains, students are using the abdominal muscles and lower back muscles to stabilize their bodies to improve balance and posture. Pre- and post-surveys will be used to assess the effectiveness of this project.